If the saying “As goes California, so goes the world” is true, UPS will soon be utilizing bicycles and trailers across the country. Translation? 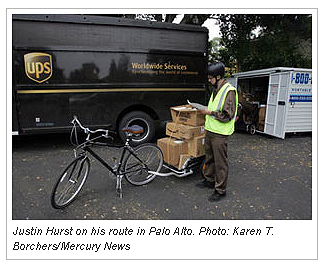 Recently, UPS started adding bicycles to some routes in Silicon Valley for the holiday rush. The company is currently using bikes on 45 routes in Northern California. The motivations are multiple, including the high costs of renting additional trucks during December, the company’s busiest time of year. But two-wheeled transport is nothing new for UPS. The company has been doing it for a few years in various scenarios. Pretty dang cool. Almost as cool as the company in Portland, Ore., who delivers Christmas trees by bike.